Welcome all you blog followers from my blogspot site. I was happy to have everything in one place. Thanks to my son for helping with this transition. I will be exhibiting about a 10 pieces in the halls of Cone Hospital in Greensboro for the month of March. My fellow artist from the Cosmic Cow Society, Phyllis Sharpe, will be showing also. 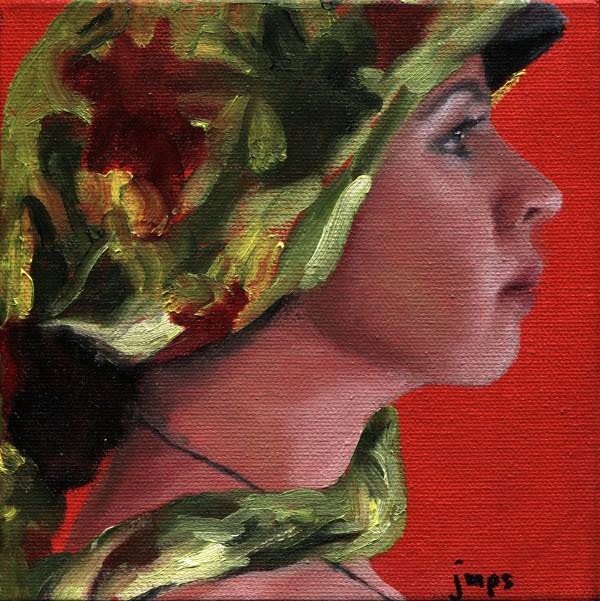 This particular painting is one of four I painted of my lovely daughter wearing different hats. I used it for my Christmas card in 2011. The artists of The Cosmic Cow Society all painted some 6 by 6 pieces for a show at the office of Kelly Mitchell, an orthodontist in Greensboro for this last December and January. I love your work, the good Lord has blessed you with a wonderful talent.